Hello Sandra, on your site I read your bio, which states that you’re a sound artist and a composer of electronic music. How does your work approach as a composer differ from what you do as a sound artist? I guess the reason why I do not just write that I’m a composer is the character of the field I work in, and the material that occupies me. I often work interdisciplinary, mixing fields of science, art, music, performance, media history, sculpture etc. resulting in works that are not just music but many other things as well. I made many works with instruments that are no traditional music instruments or which have no relation to music whatsoever. Or I have worked with music as a pure material, as objects that are investigated anew. Accordingly, I use objects such as hearing tests machines, pipe organs, tape machines and sound emitters on an equal level. I explore their sounding content but I also explore them as visual objects, as sculptures, as scientific objects or as actual performers that I can enter into a dialogue with. For me, using the word sound artist, opens the field up, in a way where composing is not just something you do when you write music for a symphony orchestra. On the other hand, I indeed consider myself as a composer, as I write music for these sound emitters, I plan a specific narrative, a structure. I do not improvise. I write my music down in some kind of score (notes or graphical) in order to be able to repeat my initial idea or thoughts. You’re currently working on a PhD project at the Aarhus University in Denmark, called Tuning the Ear. In this project, you investigate the qualities of hearing through the perspective of impaired listening. How does this research have an effect on your practice? Many of my recent works have appeared as a consequence of making this research project. I did research into the history of hearing, mainly through shifting definitions of so-called normal hearing. I have been interested in how machines and techniques have been used to define a standard way of hearing, and how hearing has been thought to be optimized by extending the ear with technology, or even cured through the use of penetrating the ear with different sounds, fluids or light… I have explored all these techniques and machines that have been used to tune our ears into normal hearing, both through a historical and theoretical approach, but also by using the machines and the techniques myself by incorporating them within new sound works. As such, I am very concerned with conducting research by doing, by engaging myself with a material in order to gain new knowledge. Is it your aim to create an experience that extends beyond the purely audible when playing live? If I understand the synopsis of your PhD correctly, you have a strong interest in the field of psychoacoustics? I definitely do intend to create sound works that move in an extended field between music and hearing science. Psychoacoustics especially is one of my main interest fields, as I am interested in exploring the psychological and physiological responses associated with sound. As such, I try to make sound pieces that aim to research an aesthetic response from the ear, but also a physical, physiological and psychological response. How important is the scientific approach in your research? There's the academic focus, but I also recognize a lot of rather dry humour in your work. When watching Live Coded Music for Obsolete Computers, for instance, electronic music composers with a desire to organize a LAN party come to mind. Watching the Sustained Effort project's footage, where you extend an accordion to such limits that at least two people are needed to play it, I was reminded of the absurd approach on Pauline Oliveros’ Deep Listening Music. Am I right? Is that comic element made on purpose or a by-product of how you work? I would love it if my work contains humour! It is not something that I work on intentionally, but I understand that people hear a humoristic perspective in my work. Earlier on, I have received comments on my work, which characterised the sounding output as naive but severe. I think these descriptions are a consequence of the limited sound universe that the machinery contains. I find it inspiring to work with the constraints of the materials, whether they are incorporated in the objects’ original design or whether I construct the constraints myself, as in the work with the extended accordion. Do you already know what work you will present at the KRAAK festival? When invited to a festival, do you always come up with new work? Do you have an inventory of works to pick from, something you feel comfortable with at a given moment, or do you improvise with the machines and tools you are currently working with? 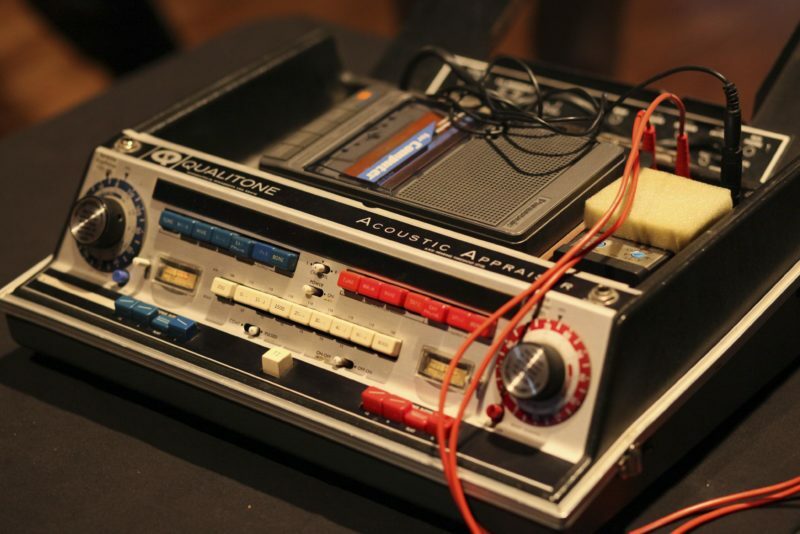 At the KRAAK festival I will present the work The Acoustic Appraiser, which is constructed around the exploration of an obsolete audiometer (hearing test machine). It is a sound piece that is almost like a radio theatre, as the performance starts out by miming a traditional hearing test situation. As the piece progress, I use the machine as a decidedly electronic music instrument. However, the machine is not intended to produce music, so the sound material is really sparse, but I try to extend the sound universe of the machine by including the malfunctioning sounds such as the machinery’s noise or the mechanical sound of pushing it’s buttons. As such, this piece is inviting people to do so called machine listening; where you do not just take the scientific knowledge that the machine is intended to produce for granted. Rather you listen the machine in a new way, which makes it clear that it is able to produce many different perspectives on hearing, which the manufactures may not have thought of when they designed the machine. You have also worked as a curator for several festivals. What was the reason behind that? Do you take up a role as an organizer with the intention to support people who are active in the same field as you? I have worked as a curator on a few occasions. 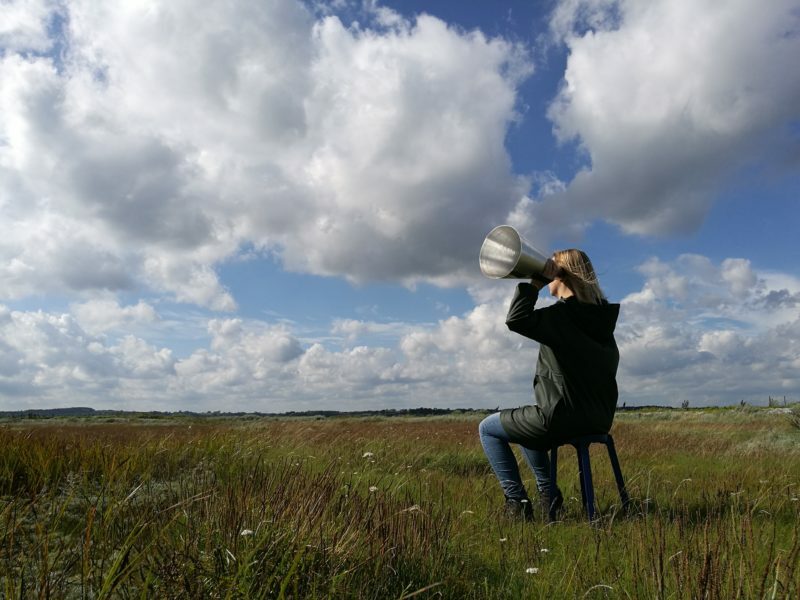 The first time was because I wanted to organize a proper sound art festival in Denmark, which, at that point in time, had never been organized before. I wanted to show the growing field of people working with sound in one context in our country. How are these two worlds (being an artist vs. being an organizer) related? Is there an internal dialogue that connects them or are they completely separated? I have been lucky to curate a couple of different events. However I primarily work as an artist. My drive to curate has always been emancipated from a wish to create something that I felt was missing in the scene, whether it has been to present an artist that I felt did not get enough attention or events that were not presented by institutions or in official events. How was your experience working on the other side of the game? My experience with curating has only made me respect more all the people who dedicate their life to organizing art events, as you have to put so much work into it, often with no or very small economic benefit. As an artist you have to be really aware of this! Ha, thanks for the compliment!